Borrow e-books, audiobooks, movies, TV shows, and more from your library 24/7! Stream on your PC or download the apps for your mobile device and select TV's. 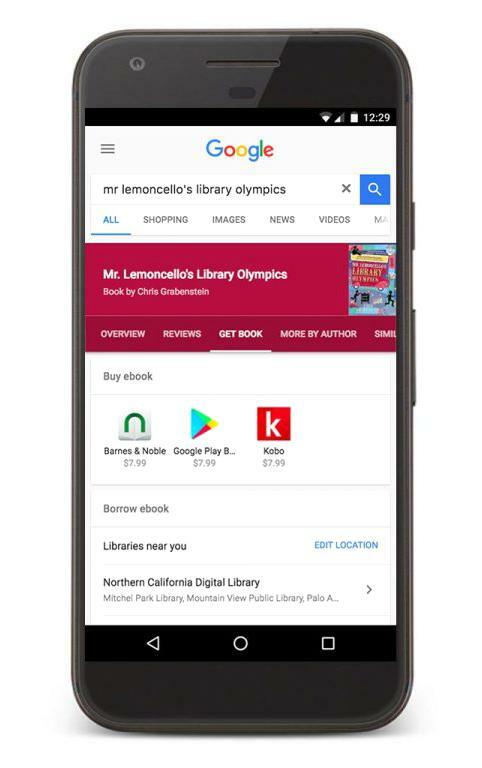 Readers will be happy to learn that Google now displays available e-book titles from your local library as you’re searching online. OverDrive, one of Berks County Public Libraries’ e-media vendors, is working with Google to display titles locally available at libraries for free instant download when searching online. If the title is available at Berks County Public Libraries, it will appear under the Reading Public Library name. Clicking the link will bring you to the OverDrive page where cardholders can sign in by entering their library card number and PIN. Non-cardholders have the ability to sample a few pages of the book. OverDrive is one of two e-media outlets available at Berks County Public Libraries. It works similar to your library, offering copies to check out to patrons and allowing holds on popular titles. Berks County Public Libraries’ other vendor, Hoopla, also offers various electronic media including e-books and audiobooks with a limit of 5 checkouts per month per cardholder. OverDrive and Hoopla are accessible 24/7 but offer different titles, so if a particular title is unavailable on one, it may be available to check out from the other. Library cardholders can also download the mobile apps for both OverDrive and Hoopla which makes searching for books easier than ever. You can find the apps in the App Store or in Google Play.